I’m not going to raise anything here that you don’t already know. 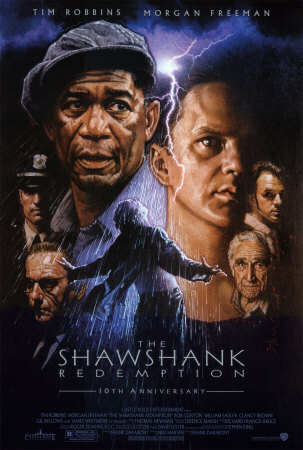 The Shawshank Redemption is one of the best films in the 90s, though it is a shame that the very things that made it great conspired to keep ticket buyers away in 1994 during the cinema run. Of course we’ve all discovered it since. Shawshank is a prison movie but it is also much more than that, despite having the classic character types required to make a formulaic film – the wrongly imprisoned, the grizzled lifer, the sadistic guard and even the quietly evil warden – at its core the film is about hope and friendship. Andy learns the ropes quickly, though his stay is not without incident. In Shawshank cigarettes are currency, violence is communication and a hard exterior a defence mechanism. But Andy doesn’t ever allow himself to lose his identity nor kowtow to those bigger or greater in number. Instead he uses his brains and quick thinking to gradually influence others to either side with him or leave him alone. But even after Andy is known as nigh untouchable on both sides of the wires, he never uses his influence to harm or even for his own benefit, he merely passes his gains on to others. At the core of the film is the relationship between Andy and longstanding convict Red (Morgan Freeman). Red is the man who can get you things, a knack that generally keeps him out of danger. He looks on wide eyed as Andy refuses to take a knee or become the victim of his surroundings, and is shocked when Andy shows persistence and (polite) boldness to both the warden and the guards – who wouldn’t think twice before beating him into submission at the merest of transgressions. The Shawshank Redemption is violent, especially in the early stages, and you could be forgiven for thinking it is going nowhere at times while over twenty years of Andy’s sentence goes by over two hours (despite no-one appearing to age much). But the film is never dull. The acting is superb, the plot moves deliberately and with purpose, and this is the first film I know of in which we were blessed with a Morgan Freeman narration. On top of that the ending is great and uplifting and allows the at times grim film to end on a high note. Final Rating – 8.5 / 10. A low key and classy drama with exceptional performances and an engrossing story. Now take care the 7 of you who haven’t seen the film yet, spoilers are below. My one query with Shawshank is how we are expected to believe that for over 20 years Andy’s big escape plan was protected by a glossy poster. Surely over the course of two decades the prison might’ve fitted in a cell change? Or tried two prisoners per cell? And why is the wall 15 odd feet thick anyway? Its not like there was no opportunity. Over the course of them film Andy finds himself in solitary on at least three occasions. No-one bothered to take more than a cursory glance around? This doesn’t detract from the film at all by the way. I just find it a little unlikely.